As featured in the May 2012 issue of desktop, over the next few weeks, we will be revealing our top 10 Australian logos of all time. Read more about the feature here. All research and writing by Larissa Meikle and Estelle Pigot. 10th place was awarded to SBS. 9th place was awarded to Australia Post. 8th place was awarded to Sydney 2000 Olympic Games. 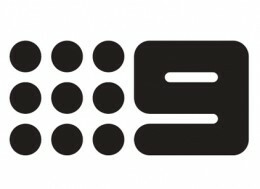 Produced and used across the metropolitan stations in 1970, the Nine Network trademark was originally designed by Brian Sadgrove and first featured a numeral nine beside nine dots (see above image). Sadgrove was originally approached to design the trademark via a contact he had with agency Masius Wynne Williams, a client at the time, which put him in touch with the network. His original trademark has withstood the test of time, remaining in use on the Nine Network in differing forms across the decades. In 1975, television in Australia switched from black and white to colour transmission. The nine dots were originally conceived to allow for a multicoloured mark; however, in 1977, they were removed, but only for on-air idents. This lasted until 1988, when Bond Media purchased the network and reinstated the nine dots. Sadgrove also designed a series of animation sequences, where the block of dots shifted in various directions. On 30 January 2006, the network and its affiliate stations relaunched to coincide with Nine’s 50th year of broadcasting. The decision to relaunch was made by interim chief executive officer Sam Chisholm and late PBL deputy chairman Kerry Packer early in 2005. 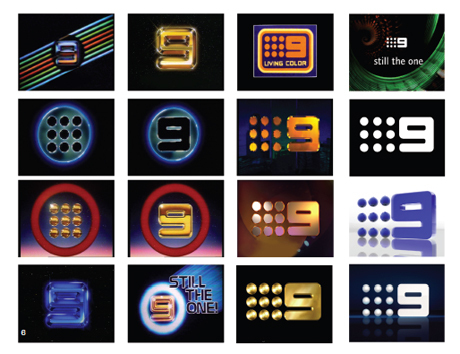 The new logo, designed by Bruce Dunlop Associates (BDA), used a 2D blue square with the numeral nine inside and lacked those distinctive nine dots, which had been an Australian television icon since 1970. The amended version of the numeral nine basically had the strokes thinned out and the internal corners sharpened off. As part of a major relaunch, Nine Network reinstated the nine dots trademark in 2008. The dots were represented as 3D discs in 2008, then 2D dots in July 2009, and then later spheres in September 2009 to the present day. “The dots were originally envisaged to take alternative forms such as multicoloured and/or repeating images, so Botoxing them (making them spherical) and using current technology to enhance them seems appropriate,” concludes Sadgrove. Thumbnail image: 1970 logo by Brian Sadgrove.